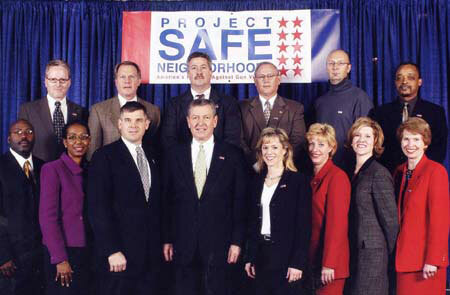 Criminal Justice assistant professor Carrie Harter (front row, fourth from right) stands next to U.S. Attorney General John Ashcroft and other members of Project Safe Neighborhoods taskforce. Sam Houston State University Criminal Justice assistant professor Carrie Harter recently received a $150,000 research analysis grant from the U.S. Department of Justice in Houston to be the primary investigator for the Southern district of Texas as part of an initiative known as Project Safe Neighborhoods. PSN is an initiative to reduce firearm-related crimes across the United States. Harter is working with U.S. Attorney Michael Shelby for the Southern district. "It's an initiative that is taken very seriously by the President's (George W. Bush's) Office and Attorney General John Ashcroft," Harter said. "We're going to see more efforts taken in this area to crack down on firearm related crime." Harter's responsibility in PSN is to provide the attorney's office with crime analysis for an assessment of firearm related crimes in "hotspot" communities in the Southern district of Texas, "specifically in the Houston area because they have the greatest need at this point," Harter said. CJ professors James Marquart and Janet Mullings are assisting Harter with the research. After the crime analysis has been assessed, Harter will present the information to an advisory committee, which will help determine the interventions to take place. "The attorneys office and the committee will determine what programs and what efforts are going to take place as a result of the crime analysis, looking at different circumstances around firearm related crime and how to appropriately address those types of crimes. We hope to ultimately achieve our goal of reducing firearm related crime in the target areas," Harter said. "Once they determine how to do that and what other partners will be included, I will evaluate the success of their efforts." Harter received the three-year grant for 2002-2005 in December, though the process will be ongoing. "After that, we're going to figure out what's neede, but we're going to track this over a three year period so that we can see how effective these efforts are and what we can to do make sure we accomplish our goal," she said. Research for the project includes looking at different measures, such as statistics and firearms reports; the different types of crimes that are being committed; and focusing in on how to address the issues that emerge. "We're in the early stages of trying to put all this together. Basically what I'll do is look at everything and get a comprehensive perspective on why these crimes are occurring and then report back to the advisory committee on what's going on," Harter said. "They will decide how to best address it and what efforts they want to take. Once those initiatives are implemented, I will evaluate the effectiveness of them. "I will be talking to different key representatives to get their opinions on firearm related crime in the area," she said. "I'll be working with law enforcement, the prosecutor's office and community groups to get a big picture." Harter got involved with the project after being asked to attend a meeting with representatives from the U.S. Attorney's Office and working with them. After submitting a proposal for the project, Harter received final approval in December. Harter's work will evaluate firearm-related crime in Houston and in the Southern district of Texas. The U.S. Attorney's Office in Houston, with assistance from the advisory committee, and Harter's report will direct intervention efforts for the project. Efforts similar to PSN have been successful in other areas, she said. "My goal is to successfully assess and evaluate the efforts of the PSN project in Houston, the PSN project in the Southern district," Harter said. "Hopefully we'll see a reduction in firearm related crime and that through the project, we'll be able to demonstrate that what efforts have been effective." In addition to Harter's work, the U.S. Attorney's Office has asked the College of Criminal Justice and the university to be the administrator over the whole southern district project, which includes a $1.4 million grant. "I think they felt like we could be entrusted to do a fair and good job in administering the grant, which is neat. I was real excited about that," she said. As a representative of the university, Harter said she is proud of the alignment they have made with the attorney's office and with Shelton. "We're really proud of this partnership with the PSN project and the U.S. Attorney's office," she said. "We have formed a really good network with them."